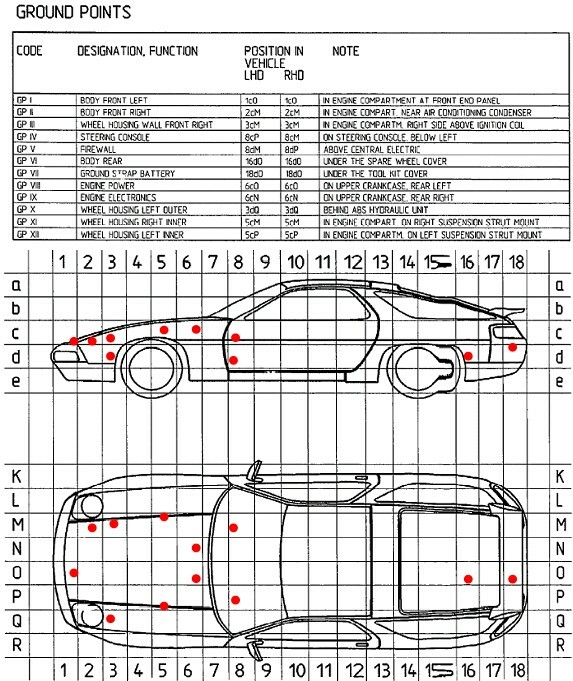 Porsche Enthusiasts Club Forum • View topic - What did you do to your 924/944/968 today? What did you do to your 924/944/968 today? Post subject: Re: What did you do to your 924/944/968 today? I ground 2 over sized washers on each side to slot into the screw apertures where it had disintegrated and then the screws clamped it down sufficiently. But a new one would be good. Hens tooth: I need 1 tiny circlip (ideally) for the n/s hatch lever rod. Any ideas? Also: Those black plastic pins with the centre pin hat hold the lining of the sunroof in place...? Yesterday, I received two hatch levers and 2 newish receptacles for the sun roof levers. Then set up the rear hatch to open properly. Took a bit of faffing with the rod barrel adjusters and swapped the release cable from the older 2.5 - funny, there was at least 10mm more thread on that adjuster. This was enough to pull the levers wide enough to release the pins. Had to swap the newish pins for the older one's - it would not release them. Sunroof and hatch all working properly. I'm chuffed. Today has been mowstly grinding the wiper motor screws out as my replacement wiper assembly should be arriving soon. It comes without motor and i'll have fun setting the replacement up with 2 new connecting rods. However, I have a power pack and shall clamp it to my vice and go from there. Also changed Crank shaft sensor and she's starting and running really sweetly. Sun's pooped out. Dying for spin (no wipers, better not rain). Must fix the puncture on my daughters bicycle to keep the peace. Cheaper and quicker delivery than Design 911. Frazerpart also very good but their web site is a bit clunky. I use a few American suppliers but post and tax can sting. I got about 12 fuel line clips with the nylon screws and mounting rubbers, 2 sunroof arm receptacles (which were virtually new) and the rear hatch levers from 944 reanmiation in the US. Oh and the rear hatch pin seals from only 944, also US. I paid £14.20 handling fee and VAT! No import duty on the seals. Can't work that one out. The stuff from 944 reanimation came to $200 dollars but no import duty or handling fee or VAT. Can't work that one out either. Far cheaper than what you would pay over here. Looks a bit lop sided there... I didn't think I sat that heavy in the driver's seat! Took the old fuel lines off yesterday. Point of note: Despite a new con rod (short side) and the acquisition of a replacement wiper assembly with a crank lever ball end in very good condition, the con rod kept popping off. Somewhat disgruntled, as the solution was a drilling or a clip and at the very least removal of the heater cover/blower motor etc to extract it (again), I had a think*. *Sometimes this works. I noticed that the resistance of the wiper was such that the crank was turning in the wiper arm but the wiper arm wasn't moving! Eeek. So I figured that I must address this resistance issue. First was the observation that the splines inside the wiper arm have become worn over time, plus the splines on the crank lever are worn too. That means that the wiper arm is sitting physically deeper on the lever, to the point where it was rubbing on the big capping washer. The solution: I ground the 22mm locking nut to a half of it's original thickness to guarantee that the arm was not sitting on it. Next was to remove the crank lever. The shim that sits on the base of the lever was very very thin. So I added another shim to make sure that when it was all clamped in, the lever wasn't pulling up against the wiper mounting frame and thus adding resistance. Greased it all up and re-mounted the wiper assembly. A 3rd issue was the big round rubber washer/seal and the metal cap was not sitting on the threaded protrusion properly (there was no locking nut on this side when I originally took it all apart). This was due to some over zealous windscreen fitter using too much sealant at some point in the cars life when the screen had been replaced. I carved some sealant out and I also snipped a 1/16th of rubber off the top of the rubber washer. It seats (almost) properly but sufficiently to clear the wiper arm. Now it all works beautifully. Not today but last Friday, drove to The Lizard, Cornwall from Southend on Sea, about 350 miles. The S ran beautifully, surprising amount of 'poke' above 4000rpm. Returned on Sunday, again faultlessly, well sort of. The gauges are not as right as they should be. Despite brimming the tank twice the gauge shows 3/4 full. The water temp is in the top quarter, but my infra-red thermometer shows the correct temp and lastly the oil pressure guage shows max. Could be common earth fault? Anyone know where the instrument panel earthing point is? Just above the steering column. (On a later 944). (Do a 6 week intensive yoga course before attempting the job). Always a good idea to remove the cluster. Clean up the electrical contacts - an eraser, some contact cleaner and some cotton buds. Don't forget under the little 6mm(?) brass nuts. Whilst we are here, I ended up cleaning up all the earth straps. The one adjacent to the headlight unit was a pig and required removing the 4 nuts holding the lever assembly and the nut on the end of the motor crank to get access. Then shifted the headlight motor and levers out of the way. Replaced the battery to ground - what a tangible difference in starting, brightness of lights, clarity of the cluster etc etc and... a much more consistent battery output and hopefully, battery life. Lost an annoying, slight hesitation during hard accelerating too. Replaced the front and intermediate gear shift assembly with a proper machined SS job from JMG Porsche. Pricey but now peace of mind eternally and again, having been used to stirring soup with whatever old jalopy i've had over the years, the gear change now is (surprisingly) sublime. Should I be surprised?! Took a bit of tinkering and alignment of both the rear telescopic threaded shaft (which attaches to the top of the n/s part of the box - bit of a contortion and loads of patience. It[s the longest part of the job that one bolt ) plus the position of the front changer was critical. The gear lever is not quite central in neutral but good enough and smooth. I could fill up another y times n cubed with all the silly jobs done on my 944 but I won't bore you. Cannot believe the price of replacing the driving lamps (the upper one's adjacent to the indicators) so i'm not going to bother for a while. I have sent some emails across the pond speculatively. I have ordered the two lower driving/fog lamps from VW heritage. One lens was cracked and on the other, the casing was loose due to one broken in screw and the screws were both seized in on both. £130 each. Ouch but cheaper than a few of the usual suspects. Have you got a part number for the top boot section for the headlight motor on that there live PET 2 please? It's the smaller section that covers the motor relay and connector block. dont like to point out the obvious, but thats a picture of a 928? Tucked her away in a new garage. Don’t normally bother but discovered rust in bottom of one rear quarter and so shall keep her dry until bodyshop slot comes available. At least one is relevant. It's like that Meat Loaf song "One out of two ain't bad". As far as the headlight motor boot is concerned, spoke to Paul at Woolies and he has brand new one's and no, you don't have to buy the whole shebang. 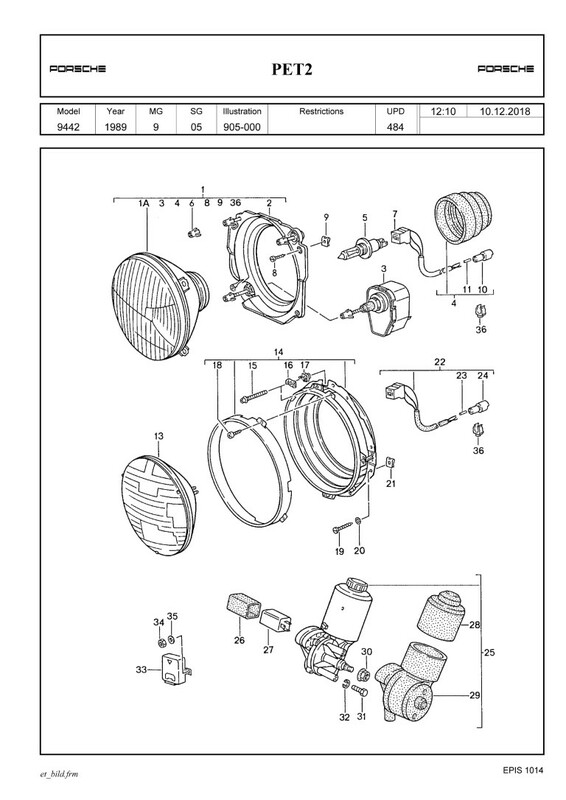 So I have ordered one... and a heat shield for under the silencer ...and the wiring loom from the connector block to the wing repeater ...and a new wing repeater lens ...and a spring and arms assembly for drivers door lock. I have told Mrs Crank Case that it will be beans on toast on Christmas day as I will be knee deep in Porker work and that's all we can afford anyway. I have been meaning to post up for ages but after I lost the last entry when it timed out and I had to sign in again, I got kind of miffed off and just sulked in the background. In the meantime there has been some forward progress but some setbacks too- all part of the joys (or so I’m told) of owning a car rapidly approaching its 29th date of first registration. So as things were left, the new rear shocks were on, as was the refurbished front ARB complete with replacement rubbers and the stiffener brackets. The bat wing needed some fettling & the calipers had gone off for some much needed attention. Today (well not actually today but whenever it was….) I decided I would try my hand at making the replacement rear hard lines. You see I’d noted that the car had supposedly had braided lines fitted at some stage in its life and although I could see them on the front; I couldn’t see them on the rear. Now, I’m used to braided brake lines being quite lengthy things ‘cos I’ve fitted several sets to various motorcycles that I’ve had & this funny hard line clearly wasn’t a braided brake line so one of the previous owners had clearly been done by the garage that said they had fitted a full set. So when the time came to remove the rear caliper and then undo the nut on the hard lines, I simply cut the pipe if the nut didn’t undo…………...................................................Oh dear! Little did I realise at the time just what I’d done (proof that ignorance can be bliss however short lived) . It was only a few weeks later when the braided line kit actually turned up did I realise the error of my ways and find the rear braided lines to boot!! With genuine replacement lines looking at £90 the decision was made to make my own - after all, how hard can it be? I cannot recommend the flaring [url]tool/www.ebay.com/itm/Copper-Brake-Pipe-Line-Flaring-Tool-Professional-In-situ-4-75-DIN-Hand-Held/262319149667?ssPageName=STRK%3AMEBIDX%3AIT&_trksid=p2057872.m2749.l2649[/url] that I got highly enough. Simple and easy to use with perfect flares every time with no fettling required unlike some alternative tools. Fortunately, I had kept all the pieces of hard line including those that eventually came out of the calipers so taping a piece of string to one end, I carefully followed the contours & bends of the line, taping at regular intervals so that I could get the overall length of pipe required to make the new versions; I added in a little extra to allow for making the flares and cut the string. Cunifer pipe is normally supplied in rolls and requires straightening before use and you can buy [url]this http://www.ebay.co.uk/p/Sealey-Brake-Pi ... 772&chn=ps[/url] handy little tool for just that task. Once my pipe was straight, (stop sniggering at the back) the string was taped to one end, set to length, the pipe marked and then cut. Despite having practiced on some small lengths of pipe to get a feel of how the flaring tool worked, I was still a little apprehensive as this was for real and not just practice. I needn’t have worried though as the tool worked just as before and a perfect flare appeared when I separated the tool. The next thing I did was to slip on the two nuts as the most common mistake made is to make the flares, bend the line to the required shape & only when going to fit it is it realized that you have no way of screwing it in! With that bullet dodged, I began shaping the line. You tube had revealed several tools available for bending the line & the one I personally found easiest to use for partial and 90’ bends was this. Again, I had practiced on some short lengths of line which was actually more difficult than with the proper length of line as you have more leverage available so it is easier to bend-still didn’t stop the anguish as the first one was made though! With this done, I taped it to the original line and then followed the contours of this applying gentle pressure to get the required shape. I‘d like to say “ and within half an hour it was done”- but that would be a pile of poo and the truth is that I was so worried about cocking it up I took a good couple of hours to get it right. With the drivers side completed and as the rear calipers were not back from the trip to the refurbishing company I simply got on with making the passenger side line. Porsche original lines have some plastic sleeving at various points so that they can be clipped in place under the swing arms without risk of chafing (ooer missus! chafing of the hard line- sounds painful). I’d given some thought to this and a conversation with sensei Waylander had come up with heat shrink- not just any old heat shrink but the glue lined stuff so it actually binds to the pipe rather than relying on friction to stay in place. Again the Bay of Flea came up trumps with what was required and on the test pieces of brake line, worked so well you would have thought it was factory applied. Test pieces are one thing but getting the heat shrink on pre-formed brake lines was a whole new lesson in perseverance, patience and other things beginning with P. Suffice to say, if I had a swear jar in the garage, I would still be in a severe amount of debt!! Having finally wrested it in place with only minor re-tweaking to the line required, it was time to shrink it down. Now, I do have a small butane powered heat shrink torch but it would have been tough going on this stuff. Then I remembered that my son was trying to sell for my father-in-law his electric paint stripper heat gun - worked like a charm so I may just have to buy it for future endeavours. Hmm that hasn’t posted quite right- anyone tell me how to post a link without showing the http address stuff? Last edited by 51rider on Tue Dec 18, 2018 12:02 pm, edited 2 times in total.